Lopez is from Virginia Beach, Virginia. After graduating from Salem High School, he attended college at North Carolina Agricultural and Technical State University in Greensboro, North Carolina. In 2004, he graduated with a Bachelor of Science in Mechanical Engineering and earned his commission through the N.C. A&T Air Force Reserve Officer Training Corps. Lopez attended phases I and II of pilot training at Moody Air Force Base in Valdosta, Georgia, flying the T-6 Texan II. He moved to Laughlin AFB in Del Rio, Texas, for phase III of pilot training, where he learned to fly the T-38C Talon and earned his pilot wings after completing undergraduate pilot training in 2006. Following pilot training, Lopez completed Introduction to Fighter Fundamentals, flying the AT38C Talon at Moody AFB prior to attending the F-15C Eagle, Basic Course at Tyndall AFB in Panama City, Florida, in 2007. Upon graduation, Lopez was assigned to the 71st Fighter Squadron at Langley AFB in Hampton, Va., as an operational fighter pilot in the combat air force. Lopez attended the F-22 Raptor transition course in January 2011 at Tyndall AFB. Upon completion, he flew F-22 Raptors assigned to the 27th Fighter Squadron at Langley AFB until October 2012. Lopez moved to Joint Base Elmendorf-Richardson in Anchorage, Alaska, and flew Raptors there from November 2012 to January 2016. Following this assignment, Lopez moved back to Langley AFB in January 2016 and served as the Chief of Flight Safety for the 1st Fighter Wing. While assigned to the 1st FW, he was selected to be the Air Combat Command F-22 Raptor Demonstration pilot. 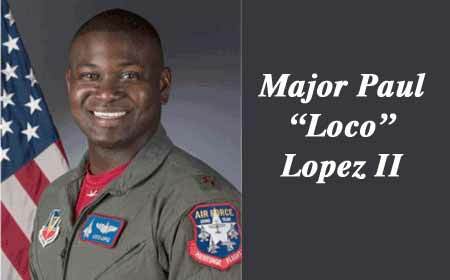 Lopez is an experienced fighter pilot with over 1,400 fighter hours flying the F-15 and F-22. Lopez enjoys being a part of the F-22 Raptor Demonstration team and accomplishing the mission of showcasing American airpower, recruiting and retaining America’s finest personnel into the Armed Forces, and enhancing international and domestic relationships.